McGue Excavation is a fully licensed, bonded, and insured excavating contractor located in Quincy, Massachusetts. We specialize in both residential and commercial sewer/water line repairs + instillation, house and addition excavation, demolition, foundations, drainage solutions, grading, site development, retaining walls. Pool fill in’s, and stump removal. We have proudly served both residential and commercial clients on the South Shore, Greater Boston, and 128 area of Massachusetts for the last five years. Owner Chris McGue has a strong belief in professionalism, timely job execution, and keen up to date knowledge of the construction industry which he passes on to his clients. He is proud holder of a bachelor’s degree from the University of Massachusetts Amherst in Building & Construction Technology and is a proud veteran of the Armed services. He continues to uphold these values by continuing his personal education in the construction field and only hiring the most experienced and qualified employees. McGue Excavation strives to work hand in hand with all customers and builders, taking a CAN DO and responsive attitude approach to all size jobs. We take great pride in working with our clients keeping them involved from the early planning/permitting stages, updating via. Email and text message of daily job progress, followed by the final site walk around and job review. Whether you’re a homeowner needing a broken sewer line repaired or a builder looking to build an entire development. Make us your first call any of your excavation or grading needs today. 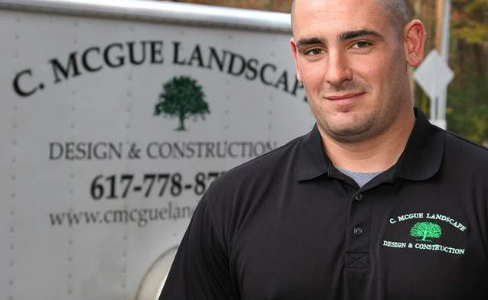 C.McGue Landscape is a fully insured Residential & Commercial Landscape Contractor offering a wide range of services for your home or business. Make us your one stop shop for any on your landscape construction and masonry needs once your excavating project is complete. We are proud to be partnered with our sister company C. McGue Landscape Design & Construction which offers custom paver Patio’s, Walkway’s, and Front Stairs Instillation, Seed/Sod Lawns, Plantings, Retaining Walls, and landscape solutions. Please visit our website www.cmcguelandscape.com to see our current projects, portfolio, and customer reviews.